Lisa Horne with her husband Andrew and son Stetson. When Lisa Horne’s son was 2 years old a small amount of a peanut butter sandwich touched his lips. The toddler began to scream and went into a full-blown anaphylactic reaction. His parents rushed him to the emergency room, where he was treated with several doses of antihistamine and epinephrine. After this frightening incident, Horne looked for local support to help guide her in the world of food allergies, but she didn’t find what she was looking for. So she took it upon herself to create it. 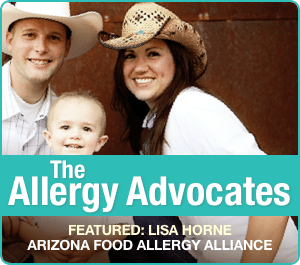 Armed with bachelor of science in business marketing and 10 years experience as a radio broadcaster, Horne launched the Arizona Food Allergy Alliance in 2011 and in four short years doggedly grew her vision into the leading statewide non-profit offering a range of programs, services and advocacy. Horne runs the organization from the small city of Show Low, Arizona, four hours away from Phoenix, teleconferencing with volunteers and connecting online. 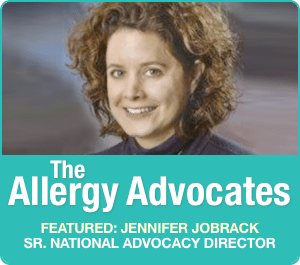 For her extraordinary efforts in serving the allergy community in her state, Allergic Living pays tribute to Horne as the latest honoree in our Allergy Advocates series. Senior correspondent Claire Gagné speaks to Lisa Horne about how she got her organization off the ground, what it offers, and her hopes for what it will accomplish in the future. You say you didn’t find the support you wanted when your son Stetson was diagnosed with food allergies. What were you looking for? I wanted more than just a meeting. I thought there should be something that was able to help individuals with their day-to-day lives and help with education, awareness and advocacy in the community. When I created the Arizona Food Allergy Alliance I developed the concept of Connect, Learn, Succeed, which became part of our mission statement. It means connecting with one another within the food allergy community, as well as connecting with the community in general – businesses, restaurants, schools and hospitals. The ‘learn’ part means educating, bringing awareness and advocacy. 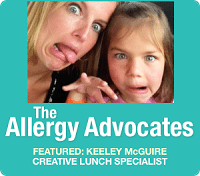 And then, succeeding – as a food allergy community, within a larger community. Who was a part of it at the beginning? I sought out other like-minded volunteers in the community so that we could work together. I got together with other parents of kids with food allergies and we talked about want we wanted to see in our community. We sat down and wrote out some goals on the topics of education, awareness, support, advocacy, and research and we took it from there. That small group has turned into a statewide non-profit organization in four years. How did it grow so quickly? There was a need. We have play dates, evening gatherings for adults and online webinars. We have a helping-hand program where people who just need someone to talk to or get information from can submit their information in an online form and we’ll set them up with a person locally who can talk to them and help them. We were the first group in Arizona to offer summer camp for kids with food allergies. We kind of pioneered that movement in the western part of the United States, and we’ve had several other organizations mimic what we do since then. 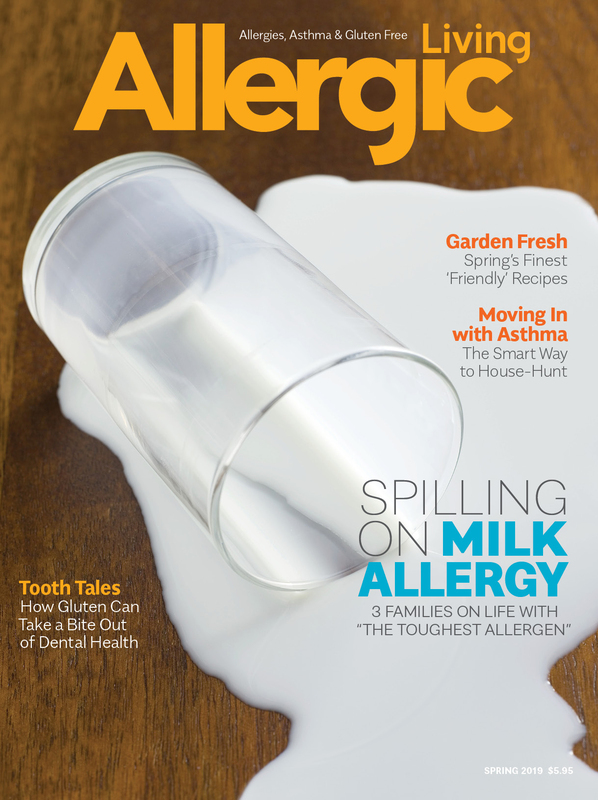 This October we will be pioneering another program that has not been seen in the food allergy community yet. It’s called a teen overnight “lock-in”, where teens can have a night out in a safe environment with games and food allergy-friendly treats. We’re trying to lead the way in a lot of the things we do, and others tend to use such an approach as an example and carry it out similarly in their communities. Your son Stetson is 7 now. What is his attitude towards his food allergy? He’s very good. He’s independent, educated and aware. He always wears his medical bracelet and he knows to always take his epinephrine auto-injector everywhere. He knows not to share food with other people or take food from other people and not to eat things that don’t come with an ingredient label. All the kids who come to our summer camp learn these things, too. What else do you do at the summer camp? It’s a three-day, half-day camp. We have magicians, a wave pool, arts and crafts – last year we had a karate training and self-defense class. We’ve had food-allergy musician Kyle Dine come in the past. Last year we had a giant movie screen put up in the gymnasium and the kids watched the movie Frozen. The idea is just to be a kid and have fun without the worry of allergens in the area. 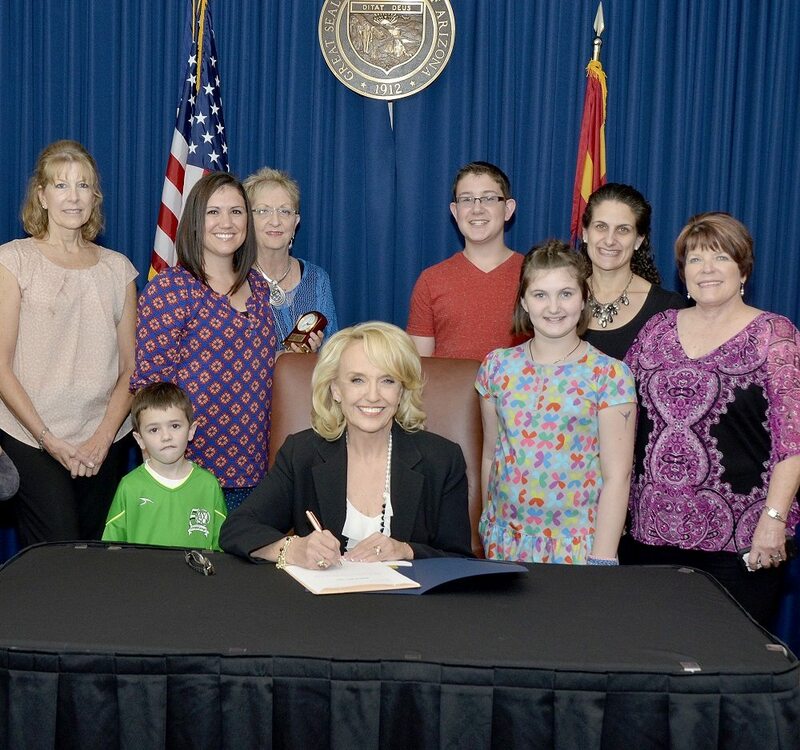 Lisa Horne and advocates with Governor Jan Brewer as she signed the Arizona stock epinephrine bill into law in 2013. Do your other children have allergies? We also have a 4-year-old, a 2-year-old and one on the way. No, the others don’t have food allergies. You run a state-wide non-profit, have three children (with one on the way), and I understand you home-school your son. How do you stay on top of everything? We have amazing team leaders. If it wasn’t for our volunteers and leaders in our communities, our organization would cease to exist. We don’t have any paid employees, we’re 100 per cent run by volunteers. We currently have 22 volunteers and four board members. It’s a very dedicated community. Your annual zoo walk took place in Phoenix on March 7th and will be in Tucson on April 4. What is the money raised used for? It’s our main fundraiser and it helps fund all of our events and programs each year. Our goal this year was to raise $35,000, which doesn’t seem like a very large number, but again, we don’t have any paid staff, we don’t have a true physical location other than telecommuting from home. So that money is used to fund the summer camps, the teen lock-in, our educational pamphlets for the community, our advocacy efforts and anything else that we do. For our summer camps – it costs $300 for a child to go to camp, but we only charge $75. We can do that with the money we raise at the zoo walks. 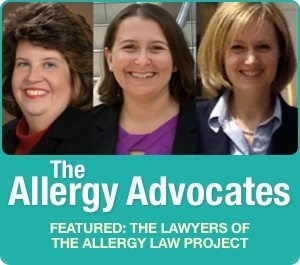 When people are diagnosed with food allergies in Arizona, do they find out about your organization fairly quickly? We have thousands of members across the state. 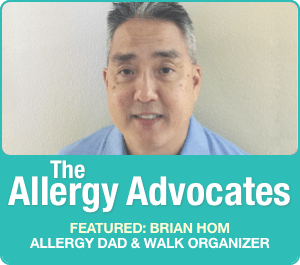 We are very well-connected with all of the bigger allergists in Arizona. We send them educational cards and our event schedule. We also have a lot of media exposure. We have our public service announcements running on cable networks as well as local TV stations, on radio and in the major movie theatre chain here in Arizona. Before becoming a mom and founder of a non-profit, I was DJ and a news anchor and reporter for several different radio stations here in Arizona. So that was very helpful in getting those connections. What are the next steps for AFAA? We want to continue to grow our fundraising so that we can further and more successfully carry out our mission. For example, it would be nice to host more than one summer day camp. It would be nice to charge even less than $75. For some of the things that we’re already doing, it would be nice to do them bigger and better.